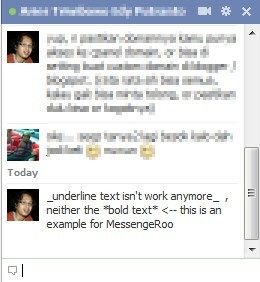 We just noticed that right now, the Underline and bold trick that usually used in Facebook Chat in the matter on bolding the text letters is no longer work anymore. We don’t know since when this bold and underline aren’t works. Yes, the underline text that used _ in front of the text and at the end of text and also the * to get bold do not work right now. We noticed that right know there is one new features that available on Yahoo Messenger 11: Message Archive now became available in Yahoo Server Online. 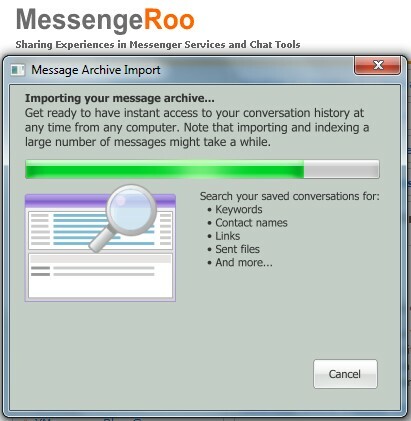 This also means that you can access all your message archive in all computer without whenever you Login with Your Yahoo Messenger. All you need to do just (if you had an offline Message archive (local host in your pc), is importing the current Message Archive to the newest version Online Message Archive. 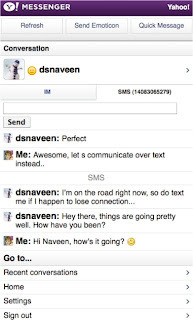 You’ll be prompted to perform this steps in the first time you uses Yahoo Messenger 11 Final Version, otherwise you can do it later by visiting: Contacts > Conversations History or press Alt + Shift + V simultaneously. In the middle of chatting, such as when you are in Chat Room of Yahoo Messenger or you make a private Instant Message (Private Message/PM) with your friend through Yahoo Messenger, you experienced that the text goes to “blank” and whenever and whatever you type any message and press “enter” or “send” button you couldn’t see any message appear or shown up. Even you noticed that your friend currently typing a message “your_friend is typing…” but after for a while you couldn’t see any message received or sent from your friend. If you faced this kind of problem, here are the steps that you must do to fix or resolve this problem. On December 11th 2010, we noticed that something got wrong with Yahoo Messenger Chat Room List: one or more Chat Room has disappeared from the List!! Though some others are not! : Chat Room List Yahoo got Error! !